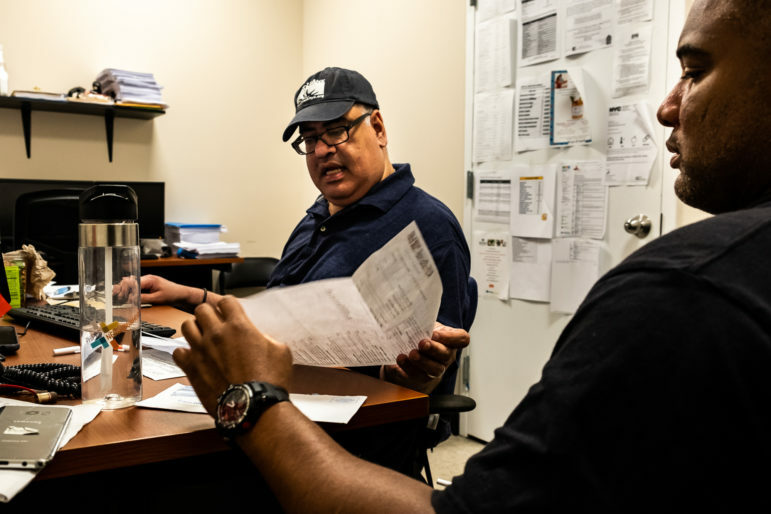 Eric Soto, Harlem Service Specialist at the Food Bank Of New York's Community Kitchen in Harlem helping Ramon Alex with his annual SNAP re-certification application. There are an estimated 1.21 million food insecure people in New York City—348,500 of them children. Bill de Blasio, while campaigning for his first term as mayor, pledged to protect food security for low-income New Yorkers. To accomplish this, he proposed a series of steps, the first of which was to ensure better access to food assistance programs for those who need it. Five years after that campaign, indications are that the de Blasio administration has mad real progress at reducing barriers to participating in nutrition programs, although the falling number of people getting food stamps could signal persistent problems. SNAP (the Supplemental Nutrition Assistance Program, formerly known as Food Stamps) is a federally funded program that offers food assistance to low-income individuals and families. The program is a hunger safety net for 1.6 million New Yorkers, a number that continues to decline from its Great Recession high of 1.86 million, despite a brief rise in 2016 as a result of Governor Cuomo’s elevation of the income threshold for SNAP from 130 percent to 150 percent of the federal poverty line. “Current enrollment aligns with trends at the state and national level and is associated with a reduction in poverty and unemployment rates, a positive outcome of New York City’s recovery from the economic recession,” says Lourdes Centeno, spokesperson for HRA. 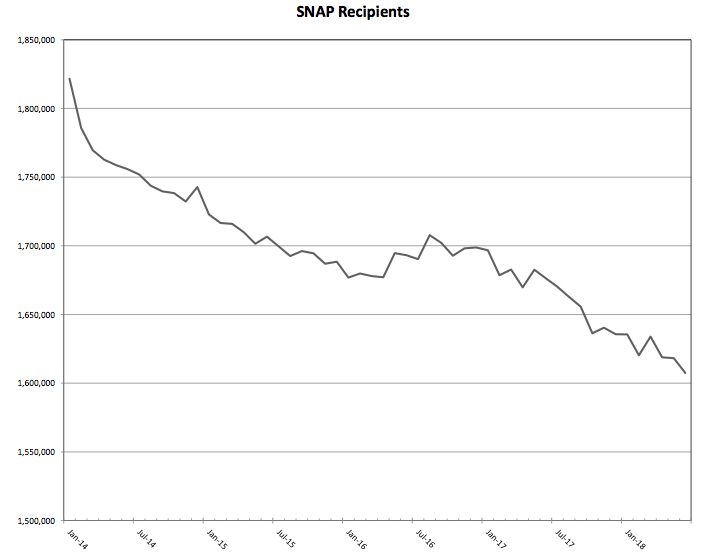 What is almost certain is that not every resident who would qualify for SNAP benefits participates in the program. In 2016, 27.6 percent of SNAP eligible residents were unenrolled in the program, making the program’s participation rate less than 75 percent. From city-wide marketing campaigns, to the modernization of the SNAP application process, to increased outreach and coordination with community-based organizations serving low-income residents, the city has been working to ensure that those who need the benefit know about it and have an easier time getting it than in the past. There have also been efforts by de Blasio, both before and since his mayoralty to do away with some of the hurdles to access previously unconsidered by his predecessor, such as advocating for the removal of fingerprinting requirements for SNAP applicants and waiving the ABAWD (Able Bodied Adults Without Dependents) limit on how long certain individuals are eligible for SNAP. More recently, the administration has been working to streamline the benefit application process. Since 2015, the Human Resources Administration (HRA) has been accepting SNAP applications through its website, Access HRA. There, applicants can pre-screen for eligibility, submit their applications and supporting documents, and manage their benefits. Last year, after observing that many applicants were already using their phones to submit their applications, the agency launched a mobile app. Today, 76 percent of SNAP applications and 42 percent of submitted recertifications are done online, and the agency has seen a 33 percent reduction in its SNAP center visitors since the introduction of Access HRA. HRA also grants provider access to over 200 community-based organizations, which facilitate applications for eligible New Yorkers. Another tool making it easier for people to apply for the benefit is the option of self-scheduled phone interviews. Ninety percent of SNAP application interviews are done over the phone. Before self-scheduled interviews became available, applicants first had to wait for a scheduler to call. They then had to be available during a designated window to conduct their interviews, a process that led some clients to miss their appointments. After applying for a waiver to change the way phone interviews are scheduled, HRA now provides applicants with the option of calling into its call center. “Those missed connections were leading clients to get rejected for their food stamp applications. Since we’ve rolled out on-demand to allow clients to call at their convenience into the call center, there’s been an increase in clients keeping their interviews, and therefore being able to receive benefits,” says Rebecca Kirchheimer, HRA’s Director of Business Process Innovation Projects. An HRA chart illustrates the fall in SNAP enrollment in the city since de Blasio took office in January 2014. Of great concern to those administering SNAP benefits is ensuring that once an eligible individual or family is in the program, that they don’t fall off. When they do, it not only adds to the number of food insecure in the city, but also to the workload of HRA to eventually re-enroll them. The agency has been utilizing behavioral science research to improve the ways in which they communicate to clients about recertification deadlines. “We try and copy some of the best approaches from the private sector around design, and we get feedback on those designs right in our centers, so we can determine the most usable approach. Along the way we’ve learned tons of lessons about what we think is useful and what ends up being the right approach,” says Lauren Aaronson, HRA’s Assistant Deputy Commissioner for Business Process. The digitization of the application and recertification process has been helpful in making HRA operations more efficient. With more applications being submitted online, case workers are able to devote more time to clients who require more assistance. Community-based organizations are also reaping the benefits. “There are populations that continue to be disproportionally under-enrolled in the program, in particular seniors and immigrant households. They require additional outreach, additional public education efforts, and additional assistance to apply. A lot of the work that needs to be done now is to focus attention on those who need a higher touch in order to access the food assistance that could make a difference in their lives,” says Stampas. HRA is hopeful that access to the state’s new Integrated Eligibility System (IES) will prove valuable to its clients. IES will enable data sharing among benefit providers, so eligibility, enrollment, and case management of benefits can be done together, allowing for a one-touch approach to client needs. Clients who apply for one benefit can more easily apply for others, ensuring that people aren’t missing out on the benefits they need and streamlining the process of acquiring benefits. Even as tools are being developed and deployed to make it easier for New York City residents to apply for SNAP benefits, funding for the program continues to be threatened at the federal level. The recently passed House farm bill imposes stricter work and eligibility requirements on SNAP recipients. Estimates suggest that the House’s version could leave hundreds of thousands if not millions of Americans without access to SNAP benefits. The passed Senate farm bill does not propose cuts to the program, however it also does not strengthen it, a problem since SNAP benefits currently do not provide enough to fully meet a household’s food needs. Even if SNAP participation was 100 percent in New York City, there would still be food insecure New Yorkers. “This would be the opportunity to address the adequacy of SNAP benefits. Unfortunately, we have a House bill that seeks to make billions of dollars in cuts to the program, and a Senate bill that protects access and protects benefits at their current level but also does not make any increases,” says Stampas. Recognizing the federal challenges to the program, the city has committed over $20 million of its 2019 budget to the Emergency Food Assistance Program and, for the first time since 2012, an $8.7 million baseline increase. However, Stampas emphasizes that food pantries should be the last step for individuals and families. “We want to make sure SNAP is strong, but we also have look at the competing costs of living in New York City. Often, food ends up being sacrificed for other expenses,” says Stampas. 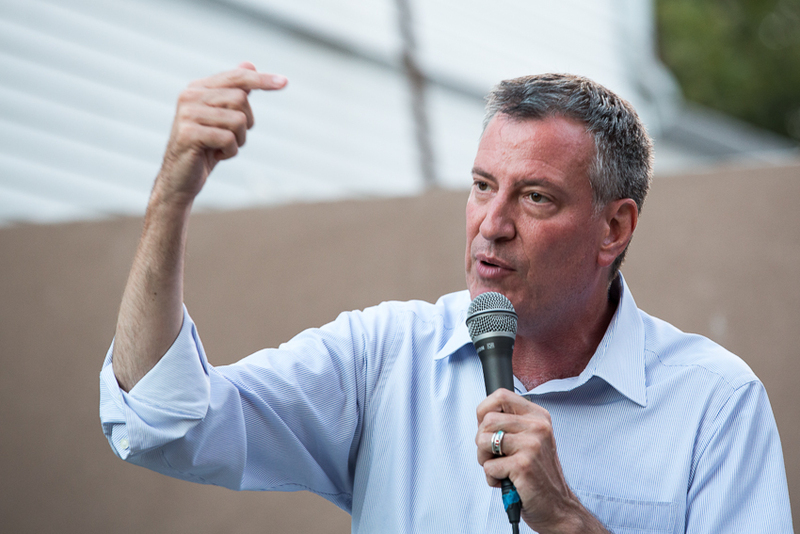 Bill de Blasio at a Democratic mayoral candidates' forum in the summer of 2013. During his run, he pledged to reduce obstacles to participation in SNAP. Enrollment in WIC is dropping also. The concern is that many immigrants are in fear that participation may interfere with their legal status and that they will lose their green cards or be denied citizenship. Could that be affecting SNAP enrollment also? Your article has left out a most important issue. The income requirement for people on fixed incomes needs to be increased so that more SNAP money is available. It is absolutely impossible for an individual with a gross annual income of $20,000 to survive on $40 a month from SNAP. The amount of money that SNAP allows for rent, monthly expenses, medication and doctors is an abomination. Senior citizens are falling through the cracks and there is no net for them. You should reach out and talk to someone about eligibility, the deductions for seniors and the disabled are pretty generous. We have an information line 212-614-5552 or call 311 for HRA. People are going hungry in the richest country in the world, while Trump gives away 12 billion dollars to soybean farrmrs hurt by his tariffs, and drastcally cuts taxes for his richest friends. Supportive housing works. But some works better than the rest. Providers are using their experiences during the first 26 years of supportive housing construction to refine their model as a new wave looms.